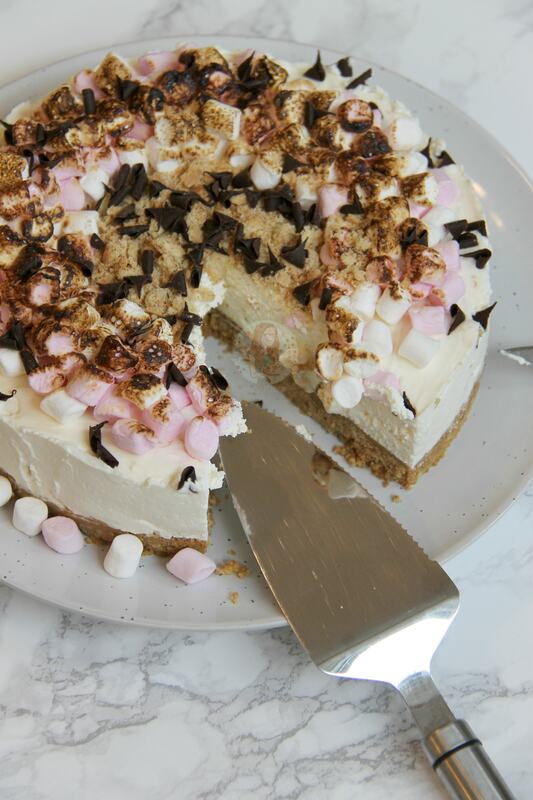 No-Bake S’mores Themed Cheesecake with Marshmallow Fluff – topped with Toasted Marshmallows, Crushed Biscuits & Melted Chocolate! 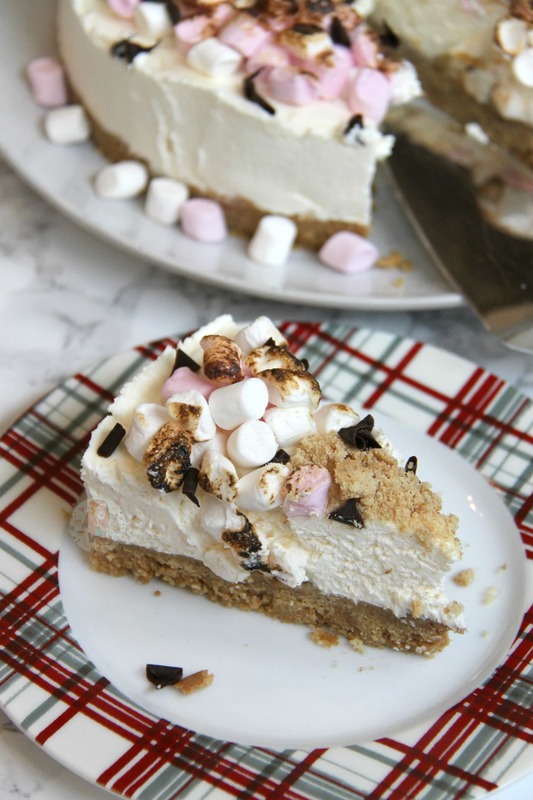 So yeah, S’mores Cheesecake. YAY! 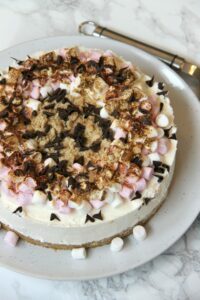 I have wanted to make this for a while, but I had so many other Cheesecake and baking ideas that I thought I would go through that list of experiments then attempt this one – and I wish I had done it sooner. I have done research into other S’mores Cheesecake recipes and a lot of them seem to be Baked Cheesecakes – and theres nothing wrong with this, but my lovely Audience (aka you!!) seem to LOVE my No-Bake recipes – so queue experiments! Please excuse how melty this looks, decided to take these photos on the hottest day of the year in the UK and my fridge was running curiously low so it was a bit of a quick photoshoot – but I have made this recipe several times, and it does set to the perfect texture! 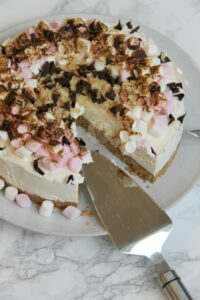 I have an obsession with marshmallow Fluff and S’mores so combining these to make a no-bake cheesecake seemed best, trying to make it as S’moresy as possible! 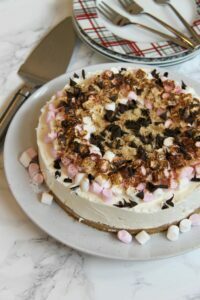 I decorated my Cheesecake with what you would find inside s’mores – and this was a deeeeelicious decision! The mini toasted marshmallows on top of the cheesecake give it that lovely campfire taste, along with the insane amount of Marshmallow goodness, and the delicious biscuity crunch – its always going to be a winner! 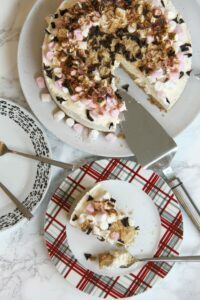 I decided to have a look at this recipe again as the occasional person was having an issue with mixing this one! I decided to reduce the marshmallow Fluff tubs to only one, and put cream into it. Whipping the Cream Cheese and marshmallow fluff was quite loose, so changing it to mascarpone I saw a massive improvement! Then adding the double cream like my other No-Bake recipes and whipping it up helped considerably! I hope you guys love the new version of the recipe! 1) Blitz the biscuits in a food processor (or crush in a bag with a rolling pin!) and mix with the melted butter. Press down into an 8″/20cm Deep Springform Tin – refrigerate for now. 2) Put the Cream Cheese, Icing Sugar, and Vanilla into an electric mixer – I use my KitchenAid with the Whisk Attachment and whisk until smooth and combined. Add in the Marshmallow fluff and whisk again – at first it will look lumpy but if you stick with it it’ll go nice and smooooooth. 3) Add in the liquid double cream and whisk till stiff. Make sure to scrape down the edges of the bowl and continue to whisk until very thick and it holds itself when you lift the whisk out! Dollop on top of the Biscuit Base and smooth over – refrigerate for 6+ hours, or preferably overnight (12+ hours) so it has time to set properly! 4) Decorate your S’mores Cheesecake by toasting some Mini Marshmallows with a blowtorch so they all mould together nicely. Crush some more biscuits and sprinkle them all over & drizzle on some Melted Chocolate or Chocolate Curls on top! If you think its not going to set it might be because you haven’t whipped it enough, or the fridge isn’t cold enough – mine is at 2C as I like my stuff super cold! If you think the mix is just a lumpy icky mess then stick with the whisking! There is such a thing as over-whisking though so don’t choose the supercharged high speed – stick at a Medium-High speed when mixing! 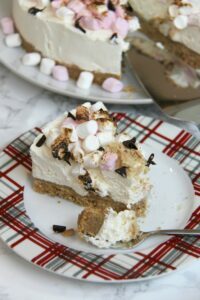 This Cheesecake will last in the Fridge, covered, for 3 days! You can find the Marshmallow Fluff with the Nutellas and such in the supermarket! Older Next post: Chocolate Bark! Newer Previous post: Coconut Chocolate Chip Blondies! Omg this looks sooo yummy !! This has to be one of the most mouth watering cheesecakes I’ve ever seen. Especially when drizzled in all those marshmallows and chocolate! Ohhh thank you!! ❤️ that’s so kind of you! YUMMM!!! Smores aren’t big here at all but the one time I’ve had them were amazing!